For those who don’t read Deadspin.com (you should unless you’re Brett Favre), here is a screen grab from the Navy beat down of Notre Dame on Saturday that these two Mids will never live down. It will be shown on those pesky Power Point presentations at their promotion ceremonies (as long as President Obama doesn’t get cold feet) and their weddings (well, I’ve said too much already). Who can blame these two? 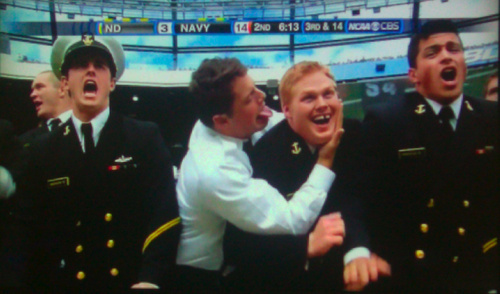 Navy had already scored two early touchdowns and they needed their defense to come up with a big stop and continue to drive the stake into crying Irish hearts across Chicago. What could possibly fire up a Mid to intensify his defensive effort than one of his fellow Mids licking another Mid’s face? I don’t know, frankly. No wonder so many Navy officials are worried about allowing women onto submarines. They’d just get in the way.